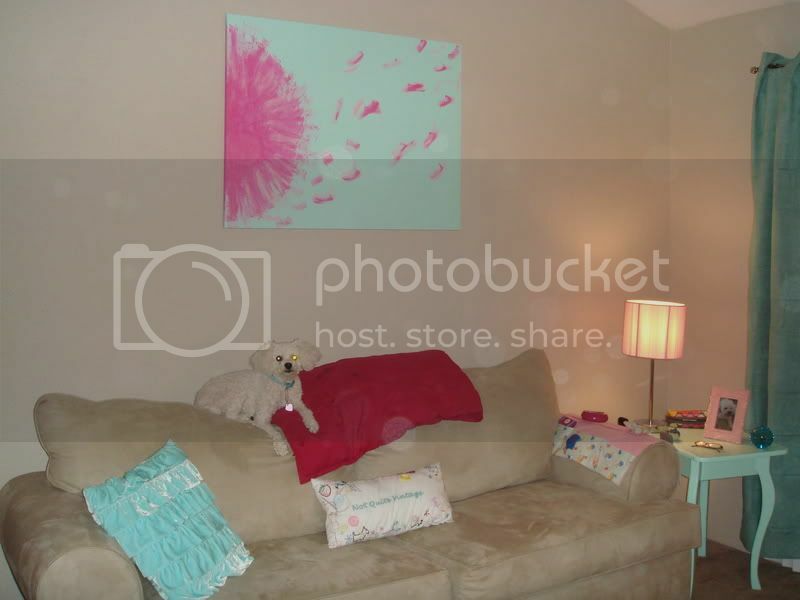 Craftster Community > HOME SWEET HOME > Interior Decorating: Completed Projects (Moderator: LovelyMiss) > Pink Dandelion Silhouette Canvas Painting! 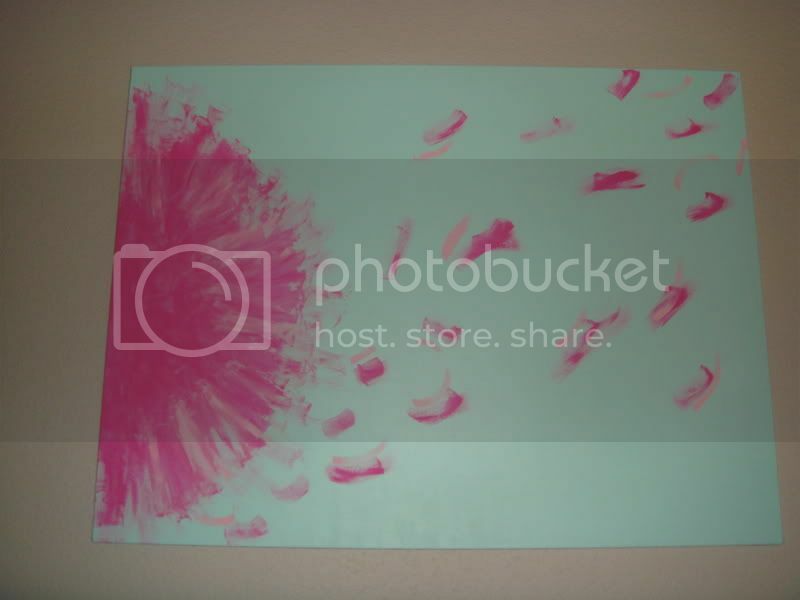 Pink Dandelion Silhouette Canvas Painting! I am so extremely proud of this project! I bought this canvas and painted the background a few weeks ago. I had every intention of using this cool stencil of a dandelion silhouette to paint the dandelion on there. But... I finally got tired of trying to get to the print shop to blow up the silhouette just right and when I started thinking of what a pain in the you know what it would be to actually cut out the stencil and then get it on there just right.... and yes, I am usually a perfectionist.. so, I knew I would go nuts the second I messed up.. and I also knew that I would most definetly mess up! Lol.. breathe, Amy.. so, I just picked up a brush and some pretty pink paint and went at it on my own. I figured I could always paint back over it with the aqua if it looked too bad. Well, low and behold.. hope I spelled that right... it didn't turn out too shabby! Keep in mind, people, I have never painted anything before in my life.. well, except for a few tables and a couple of bar stools lol. Anyways, I really hope that you-all like it. I really do love it! 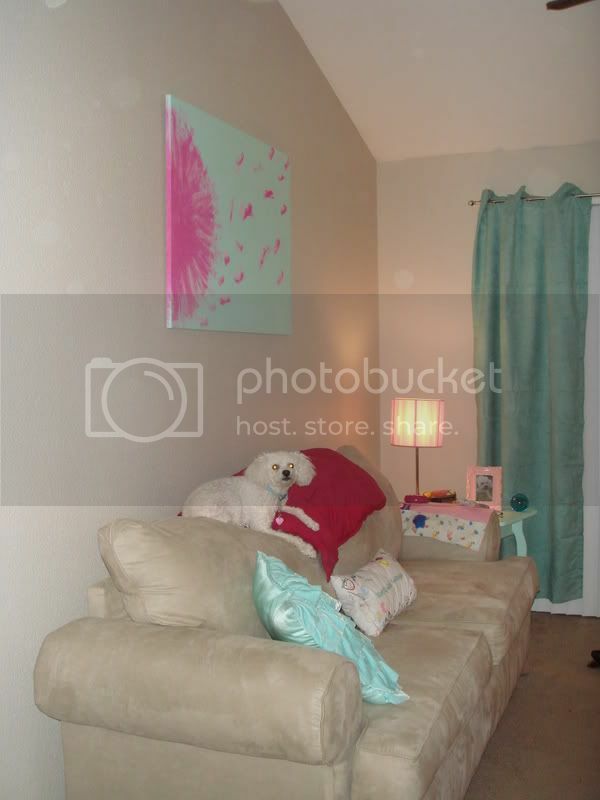 Re: Pink Dandelion Silhouette Canvas Painting! I love it! I can't believe you freehanded it - gorgeous. It's beautiful! And it matches the rest of the room perfectly. That is so pretty! I love it! Well done, it has such a nice summery feel to it! 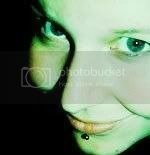 My Livejournal - My crafty blog, my moany journal, my contemplative brainspew. I just posted on your other thread asking about this! I absolutely adore it.